In an Era where electronic cameras come and go with rapid regularity, I still enjoy working with are rangefinder cameras that were produced between the early 1930s to the late 1950s. For example - the Leica II, shown above, from 1932 still works fine and is most definitely fun to use for not so modern photography. The Leica II was the first commercially successful, small 35mm format, rangefinder camera with a reliable focal plane shutter and with a standardized lens mount, which allowed for interchangeable lenses. Today there a multitude of interchangeable lens cameras - but this was cutting edge technology in 1932. In spite of its age - the Leica II is still a very usable camera for daylight photography. With the collapsible 50mm Elmar lens or 35mm focal length Summaron, the entire Leica II package will comfortably fit in coat pocket. 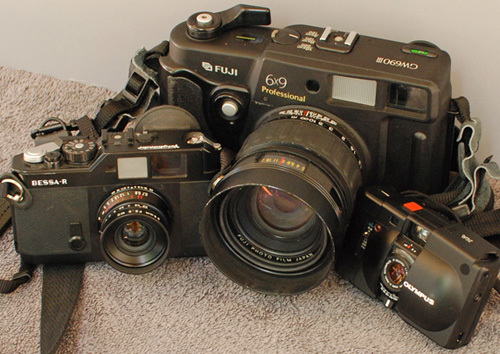 Today, rangefinder cameras is a very dated camera design. By 1962, they were already giving way to a newer option, the SLR, which is all known as a single-lens-reflex camera. For the most part, SLR camera are not at all pocketable. Leica is still in business. 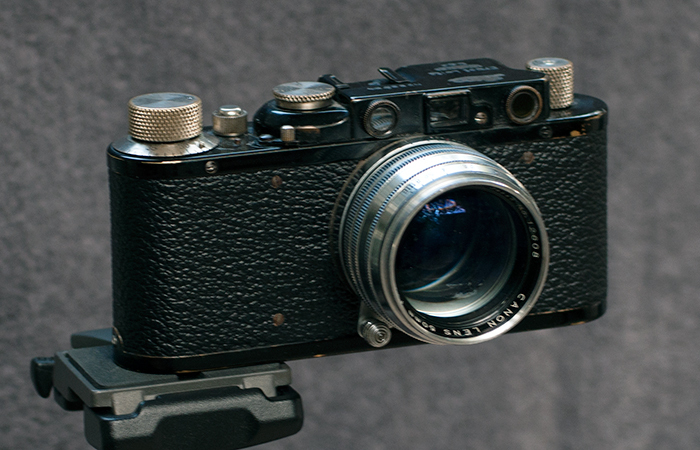 The photo below shows the rangefinder focusing apparatus of a modern digital Leica, which isn't much different than its forbearer, the Leica M3 of the late 1950'ies. The above image is from a recent Leica brochure. If it is coupled to the lens, a rangefinder apparatus is what allows the photographer to focus quickly and with surprising precision. 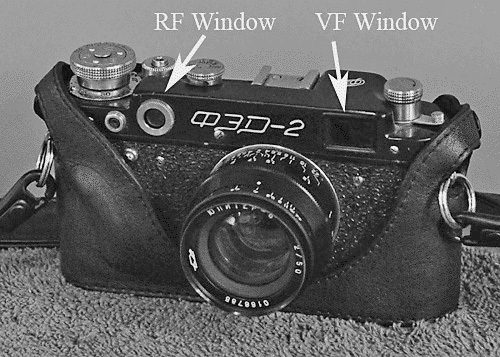 A typical rangefinder camera of the post 1957 era is recognizable by having a large viewfinder window built into the front of the top cover, plus a second smaller front facing window off to the opposite side and frosted window in between the two. A rangefinder camera incorporates a separate optic system from the main imaging lens in order to assist the photographer when focusing the camera. The viewfinder window gathers the larger of two images that the photographer sees when looking through the viewfinder. 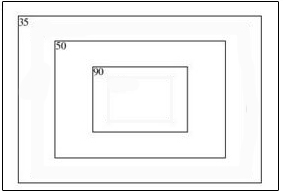 A rangefnder window sits in front of a a stationary prism or moveable mirror that reflects a second image toward the viewfinder. Ideally, this projected secondary image moves horizontally as the lens focus ring is adjusted. On a coupled-rangefinder the imaging lens is able to engage a small sensor arm in the camera body. The sensor arm pivots either a moveable mirror or a small lens as the focus on the image taking lens is set. A Soviet FED 2 - circa 1956 - which typified the Golden Age of Rangefinder Cameras. As noted above, the reflection from the RF mirror or prism passes moves across the camera's top cover towards a small lens before reaching either a half-silvered, beam splitter mirror. 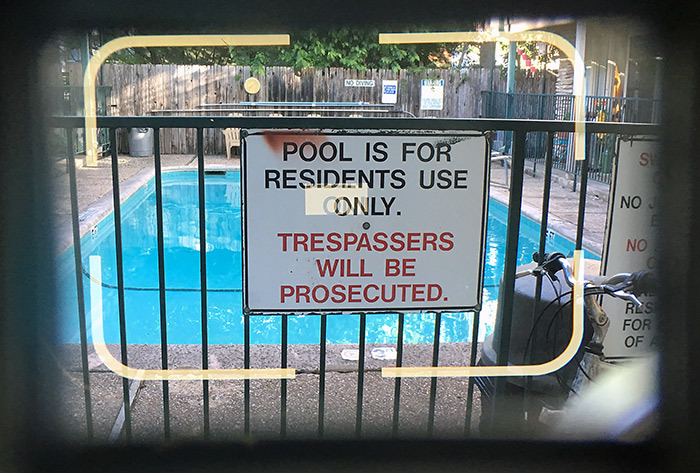 This reflected secondary image is often referred to as the rangefinder patch and it is optically projected into the center portion of the viewfinder image. Within the RF patch, the photographer sees two images that are superimposed on each other. The twin superimposed images of the intended subject in the center portion of the viewfinder are what assists in setting the manual focus ring on the lens. When the photographer adjusts the lens focus ring on the imaging lens on camera with a coupled-rangefinder, the small secondary image projected from the the RF window will appear to shift sideways. Once the RF image coincides with the main VF image to form a single image, the camera lens is in proper focus. What not to do while focusing: If the photographer puts a finger over the RF window at the front of the camera - the rangefinder patch will magically dissappear from the viewfinder. The main weakness of the typical rangefinder camera's design is the optics for its viewfinder usually has a fixed magnification and field of view. 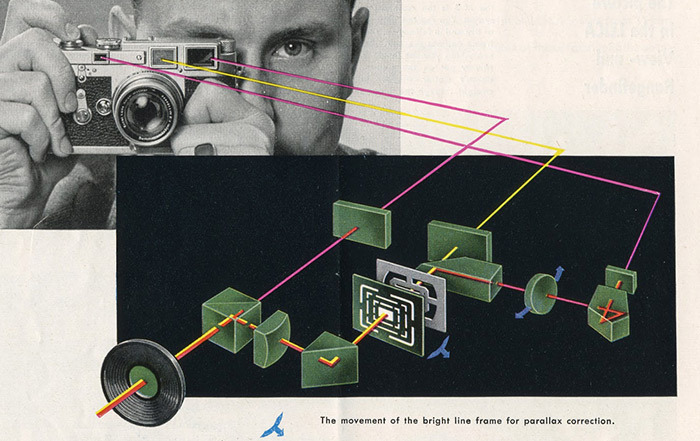 In other words, the viewfinder's optical path is not through-the main imagining lensR. 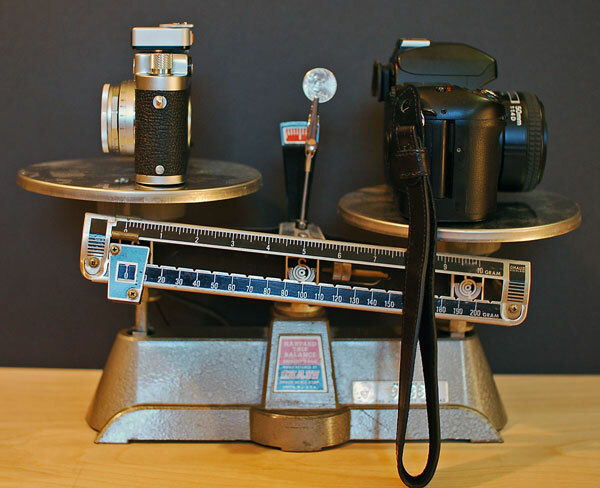 Unlike an SLR camera, whenever the photographer mounts a lens of a different focal length to an RF camera - the image magnification that one sees in the viewfinder does not change one bit. Consequently, early rangefinder cameras required the use one or more accessory viewfinders to provide the proper framing necessary for any lens other than a 50mm focal length on a 35mm camera. An honorable mention: Canon rangefinders from the early to mid 1950s used a viewfinder with variable optics. An adjustment lever located beside the viewfinder changed position of the viewfinder optics to three specific magnifications, suitable for a 50mm, 100mm or a 135mm lens. For whatever reason, the downside was the optics used by Canon were not of the highest quality and therefore, not very sharp at the highest magnification. Plus, the 28, 35 and 85mm lenses still required the use of an accessory viewfinder. The image below shows an example of a photographer using an accessory viewfinder with a wide-angle lens. He is using an add-on viewfinder with the wide-angle lens, because the lens exceeds the field of view of the camera's built-in viewfinder. The accessory viewfinders slide into the top mounted accessory shoe - which is today has evolved into the flash shoe. This type of accessory shoe is sometimes referred to as a "cold shoe" by photographers. The best accessory viewfinders provide a 1:1 magnification. 1:1 finders allow the photographer to shoot with both eyes open by producing an image magnification that is identical to our normal vision but with frame lines projected to one eye. In other words, the photographer has his or her normal vision, but with a set frame lines superimposed into center of his or her field view. This proves to be quite useful for photographing street action. On the other hand - this can be very disconcerting to someone who has only used a single lens reflex camera. 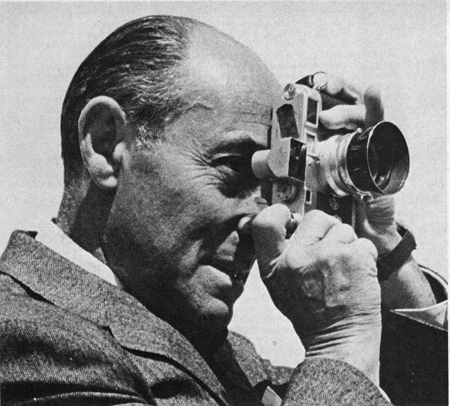 After 1955 - the high-end solution to reduce the need for accessory finders was to to add two or three sets of frameline masks that could be independently superimposed to the rangefinder camera's above-the-lens viewfinder. The other solution was to have a complete set of reflected frame line at all times towards the viewfinder eye piece. Each set of frame lines for a higher focal length lens occupies only a cropped portion of the full viewfinder.. Bottom line - when using a 90mm or 135mm lens, the photographer - the framelines occupy a small area within center of the viewfinder. In the above photo, the 90mm frame lines on my Leica M2 have been enhanced in Photoshop, but one gets the idea of what they look like in the viewfinder. In real life the frame lines are the same color as the rangefinder patch. More importantly, notice how the 90mm lens protrudes into field of view, which is slightly wider than what is required for the use of a 35mm focal length lens. More than any other on image on this web page, the above photo shows what I mean by the phrase, "above-the-lens viewfinder". Also, the projected frame lines move automatically as the photographer focuses the lens to prevent parallax errors. Owner's of rangefinder cameras designed before 1955 need to be aware of parallax errors as one focuses on objects that are very close to the camera. 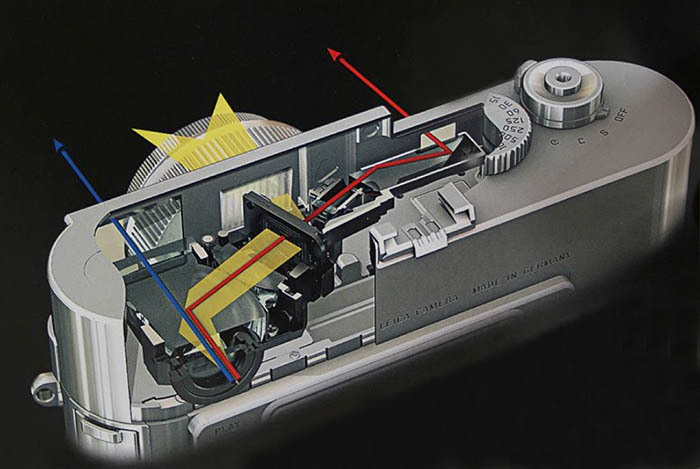 The image above shows the optics used for the above-the-lens viewfinder/rangefinder apparatus for a Leica M3 - which introduced projected frame lines for composing with three different focal length lenses. The Leica M3 camera was introduced just before 1955 and to put it mildly, it set a new standard for above-the-lens viewfinders. When mounting either a 50mm, 90mm or 135mm Leica M-mount - lens the proper set of frame lines would automatically appear in the viewfinder of the M3. Yet another honorable mention but this time for the Nikon SP, which was introduced in 1957 with a 1:1 viewfinder magnification and four selectable sets of frame lines in its main viewfinder and two more with a built-in secondary finder. * The main 1:1 finder has user selectable frame lines fore either a 50mm, 85mm, 105mm or 135mm focal length lens. * The smaller, secondary finder allowed the use of either a 28mm or 35mm focal length lens, which brings the total to 6 sets of frame lines versus 3 in the Leicas. By 1970, with the exception of Leica, mass market rangefinder cameras were for the most part relegated to consumer grade 35mm cameras with fixed-lenses. Fixed-lens 35mm rangefinder had been a staple product in the amateur photography segment of the 35mm camera market since about 1955 - or even earlier, if you include folders. Fixed lens rangefinders were the more affordable option for 35mm film film photoraphy. * The bad news is a fixed-lens rangefinder offers only a single focal length lens, which is built into the camera at the factory and not removable. *The good news is that the lenses fitted to the cameras were usually very well spec'd for the times. During the 1960s and 70s, the standard lens on many fixed-lenses rangefinder cameras had a maximum aperture opening of f/1.7. This allowed them to take photos in low light - without having to install a flash unit. Canon, Konica, Minolta, Olympus and Yashica pretty much dominated the fixed-lens market during the 1970s. More often than not - the image quality of fast prime lens built into the fixed lens rangefinder camera would of a prime lens on an SLR. In late the 1970'ies these fixed-lens 35mm rangefinder cameras would almost alway surpass image quality that were taken with a mass market zoom lens. In addition to the usual fast prime lens, - nearly all of the 35mm fixed-lens rangefinders from the 1970s had an automatic exposure mode - which prior to 1975 wasn't a common feature to most SLR systems. By 1980 the all metal bodied, eletro-mechanical 35mm camera with a spring and gear driven shutter mechanism was for the most part obsolete. Prior to 1980, if you bought a 35mm camera from a reputable manufacturer, it was built on a metal chassis and its outer shell was made of pressed brass or a stamped steel. All that was about to change. Essentially, with the exception of Leica, the days of a 35mm rangefinder photography were coming to an end. Only a couple of fixed-lens rangefinder cameras survived to struggle against the onslaught of the plastic bodied, point and shoot genre of electronic cameras. Plastic bodied electronic cameras took over the affordable niche that was previously occupied by metal bodied, rangefinder cameras. The reason: electronic autofocus modules assembled by machines are less expensive to produce than hand-assembled, all glass optical assembly needed for a rangefinder apparatus. Electronic shutters and plastic parts, such as gear assemblies to transport the film, bring down manufacturing costs. In the photo above this section are three cameras made after 1980 - all three contain various amounts of plastic components. By the end of the 1980s the mass market compact 35mm camera offerings began to feature built-in, autofocusing, motorized zoom lenses - most of which were to say the least constructed on the cheap side and fully electronic in their operation. A zoom lens makes the transition to different focal lengths nearly seamless - but there are some trade offs - such as distortion at either the wide or long ends of its variable focal length - in addition to the slower f-stops that are a common affliction of many consumer zooms. I used to joke that slow consumer zoom were killing slow speed 35mm films. Well, the days of 25 ISO film are gone. By 1980 in order to bring down the purchase price of an SLR and lens combo, even the once prestigious 35mm SLR would also see the introduction of cheapened, plastic clad, entry level cameras. Plastic bodied SLR cameras with autofocus systems and mediocre kit-zooms flourished at a price of what consumers are willing to pay for a camera/lens combo at their local big box, discount department store. Lenses prior to 1980 used a brass or aluminum focus helical. Nikon, amongst others, would introduce an amateur line up of lenses, which were assembled from plastic parts. Over time these assemblies become a little loosey, gooosey in their operation. Not many photographers noticed that the new affordable zooms may even have mix of plastic and glass elements in their optics? Keep in mind that an all-glass lens element is expensive to grind and polish. Look up the plastic-glass compound lens process used by Nikon to produce its aspherical elements. Previous to 1992, Nikon would have had to use an all-glass aspherical element in such a lens, which can have upwards to 11 to 14 glass elements. After saying all of the above - I must point out that pre-digital, 35mm SLR cameras from 1990 to 1999 are an incredible bargain in today's used market - (due to everyone having abandoned film cameras in recent times). I mentioned this - because I just purchased a Nikon N80 SLR body with a plastic zoom lens for a mere $20. The good news is the N80 uses the same AF-D primes that I've purchased over the years for my digital Nikon SLR cameras- but I must say the build quality on both the camera and lenses definitely a step down from what I'm accustomed to - even compared to my least costly rangefinder camera/lens combo, which was almost $50 USD. First, a SLR is much noisier than a RF camera due to the movement of the reflex mirror and some of the shutters used. In the case of my newly acquired Nikon SLR, the autofocus is also a tad noisy and sometimes it will tend to hunt for a focus point as well. When it comes to compactness a 35mm SLR cameras isn't even semi-pocketable. A SLR viewfinder will momentarily black out when using slow shutter speeds, which is no biggy. On the plus side: Unlike with a rangefinder camera - macro photography is a breeze with an SLR and the photographer can change focal lengths with seamless ease by using a zoom lens. With the latter, one doesn't need to reposition of the camera to recompose the exposure for the proper crop with zoom lens, especially when transitioning from a full body to a head and shoulder portrait. Auto focus and auto exposure mode featured SLR cameras make them way quicker to use than an old-school rangefinder camera. For example: when is the last time a modern photographer pull out a hand-held incident meter to set the exposure on their camera? In low-light settings - a slow f/4 to f/5.6 zoom lens on an SLR results in a darker viewfinder. For indoor exposures, a slow f/4 to f/5.6 zoom requires the use of flash inorder to maintain a hand-held shutter speed. Consumer level zoom lenses are usually optically compromised at their widest and longest range. The compromised optics include a fair amount barrel distortion at the wide end & some pin cushion distortion at the long end. Resolution of fine details and color vibrancy takes a big hit as well. Compared to the typical single lens reflex camera, the shutter sound on most rangefinder cameras will be less obtrusive, some are nearly silent. &mbsp; A quiet camera is a major plus when shooting in a church, classroom, small cafe or any other peaceful venue. It's also nice that the above rangefinder camera will also slip into a coat pocket when not needed. The Nikon N80 on the right side of the photo below is actually semi-pocketable, if you don't mind the bulge. The Leica on the left has it's 50mm lens retracted into the camera body. So, there is less of bulge when it is in a coat pocket. The photo above is a bit of cheat due to the retractable lens on the Leica. Before touching upon why older wide angle lenses are more compact than modern lenses, a few words in order regarding build quality. Prior 1970 rangefinder camera lenses had a nicely machined, focusing helical, which was usually made of brass. Unlike modern lenses, some of which use a loosely fitted plastic helical - many of the older lenses had a relatively long focus throw. A long focus throw means that the photographer has to rotate the focus ring 180 degrees to cover the full focus range from 3 feet and infinity. On a long focus throw lens - there are clear engravings to show each one foot interval from about three feet to about 8 feet, with some up to 10 feet - and - there was plenty of space between intervals. This made the older lenses much more reliable when zone focusing prior to bringing the camera up to one's eye. When situated close to his or her subject and taking the time to use the rangefinder, focusing was a dead-on the money affair. The downside to long throw focusing lens was lazy photographers felt that 180° of focus throw was excessive or in internet forum speaking not quick enough. Today, lenses only have only have 30 to 45 degrees of focus throw - which results in a lens that is less accurate when focusing at close range. The marked intervals may only show closely spaced intervals such markings not engravings that show intervals that include 3, 5, 7 and then jump to 20 feet. To add to this less information is more school of thought, if depth of field markings are included, the modern lens often only shows those for f/11 and f/16. Older wide-angle lenses for rangefinder cameras sit almost flush to the camera body, while the same focal length lens for a SLR stick out at least couple of inches or more from the lens mount. There's a reason for that. Due to the lack of a mirror residing behind the lens mount, rangefinders prior to 1970 were able to use a compact symmetrical lens design for their shorter focal length lenses - such as a 21mm or 28mm. A symmetrical lens short focal length is great option for making the camera and lens combo very pocketable. On at least a few symmetrical lenses, the rear most portion of the glass elements extend rearward in the camera body almost to the focal plane shutter. Two excellent symmetrical examples inclue the first version of the Elmarit 28mm / f2.8 or the venerable 21mm / f4 Super Angulon wide-angle lenses by Leica. Mounting a symmetrical lens that close to the shutter on a 35mm SLR would be impossible - due to the space needed for the movement of the reflex mirror. 35mm SLRs need use a retrofocus asymmetrical lens - The rear most glass element a little forward to a nearly flush position, relative to the lens mount. Bokeh - the blurred elements of an out of focus background blend together more smoothly when compared to an asymmetrical lens on an SLR. Symetrical lenses have significantly less barrel distortion in the periphery of the final image. The front portion of the lens protrudes only about an inch from the camera body. First and foremost, a wide angle lens with symmetrical design will interfere with built-in light meter of most interchangeable lens RF cameras that were produced after 1970. Secondly, the downside of symmetrical lenses they tend to be slow with regards to their wide open f-stop. For example: a f/4 21mm is about as good as it gets with a symmetrical lens design. Another example: a f stop of 3.5 would be typical of an older symmetrical wide-angle lens. In order to build a wide angle lens that can shoot at f/2 or better yet at f/1.4 requires some big glass elements are needed that just will not fit into the throat of the lens mount on a 35mm rangefinder. Modern photographers who want to be able to shoot with a wide angle lens in a dimly lit room will need to use a modern reverse telephoto, wide-angle lens - which is of an asymmetrical design and often looks like it belongs on an SLR. 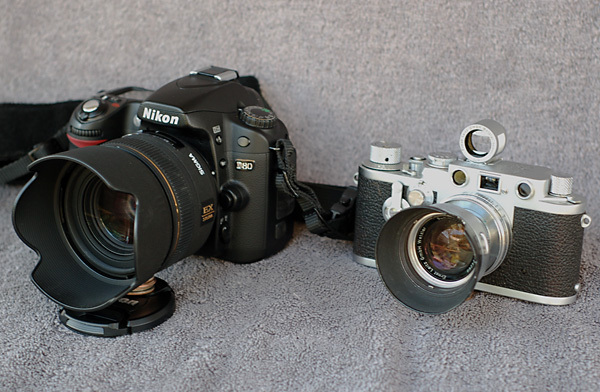 Ken Rockwell has a web page, no pun intended, that mirrors this Rangefinder/SLR comparison. 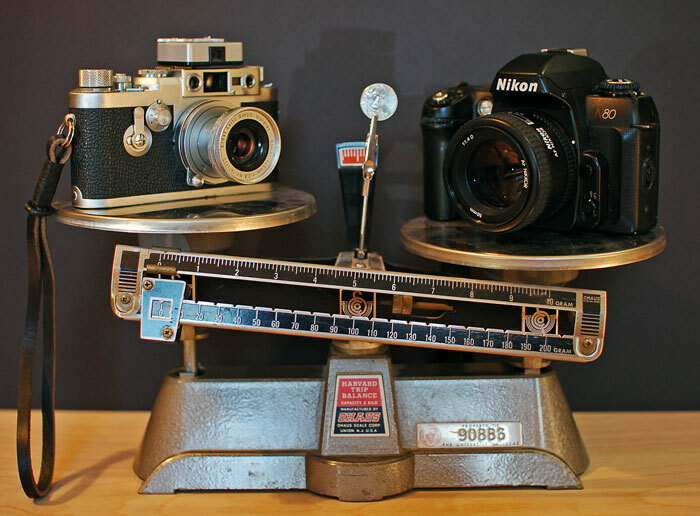 When I placed the two film cameras shown above, I fully expected the rangefinder to weigh more than the SLR. As can be seen, quite the opposite occurred. Aside from its noisiness and extra bulk - the $20 film camera on the right side of the scales will do everything a rangefinder that is worth hundreds of dollars can do - plus - it it will perform a multitude of tasks at the touch of the shutter button. Digital photography is a different ball game when it comes to frugality and the number of buttons, dials and switches. Compare this the nearly twenty controls on a modern digital SLR - if you add together the two number of buttons, switches and command dials a proper digital SLR camera. For now, it's best to ignore the number of options available in the user custom settings menu. Honestly, other than complexity of their design, I have no complaints regarding the build quality of either my Nikon D300 or D700 camera. Some would say, I need an upgrade, since these cameras only provide a 12 megapixel image. Both were bought used and the latter was recently purchased for $500 in less than perfect condition. Take that Leica II shown at the very top of this web page. It is antediluvian in its simplicity. The bottom line is that a iconic camera like the Leica II or even a legend in its own right, the Leica M2, will never ever think to automatically set any of their three manually set controls. All photography captures a moment that is a fraction of second event that is frozen in time. Hence, the word snap shot. An image frozen in time is very different than how we view the real world or even a video. I'm an advocate using digital for volume photography - and - using film for when there is time to exercise a little old-school craft. Think of tools. With a digital SLR, the modern photog can make hundreds of shots in a day, but ascetics of each image is definitively different than an what is capture on film using a vintage lens. A digital SLR is ideal when one wants to capture a scene with near perfect clarity. For most images that will be viewed on an electronic screen, digital capture really is an ideal medium, even though I do wish that folks would make more physical prints of their digital images. Film capture on the other hand was originally intended to be viewed as a physical print rather any successor of the television screen. That need for a physical print is both a strength and a weakness - but however someone feels in regards to having to make a print, if done well the print encourages the viewer to linger on an image, especially when it is viewed decades later. Rather than portray a subject exactly as the human eye would view the scene, my main objective with film and an older lens is to portray the subject as I the photographer wants you to view the scene - which will be as a frozen moment in time. In other words, what is to be recorded on film is a subjective interpretation of a real life moment. That reality has been manipulated by first the grain that is an essential characteristic of analog film, plus the play of ambient light and if applied, the flavor of the blurred background. Not every photograph needs a blurred background, but those that do manipulate how someone will view the photograph. The flavor of the blur in a photograph is referred to as bokeh by modern photographers. Good bokeh exhibits a creamy and smooth blurring of out of focus elements or areas in a photo. This creaminess is easier to attain with older lenses which were built with rounded versus pentagonal or hexagonal apertures. My favorite is when background is out of focus just enough to bring the viewers eye to directly to the main subject in the photograph upon the first glance - but still have enough detail in the background to allow the viewer to see the context of the rest of the scene when he or she further studies the photograph. Yes, someone knowledgeable can accomplish all of above by manipulating a digital image in Photoshop - but that takes one further away from just relying on light, a lens and shutter. Why not start with a film image, even if there are add-on software plug-ins to Photoshop, which one can purchase, such as Color Perfect or DXO FilmPak, which will deliver the look of film capture. Compared to most modern digital cameras that are compact enough to fit in either a coat or a generous pants pocket - I still prefer to take a compact 35mm rangefinder camera with me on a hike all alone or an event with other people. I usually only bring whatever lens is mounted to the camera. If it is an event with musicians or athletes performing on the field, I'll usually be taking photos of the individuals watching the event, rather than just the performers on the on state or on the field. Like everyone else, I'm using a digital SLR camera for the bulk of my photography, especially while I'm on the clock at work. At the very minimum, the daily use of digital SLR keeps one in practice with regards to composition skills. With that said, I'm not a big fan of the type kit I need to bring along when traveling - which in my case is not only a spare battery, plus charger and one spare lens, but I also feel compelled to bring the laptop computer and its charger. With regards to purchasing a compact digital, I've been sitting on the fence whether to purchase a mirrorless cameras that uses an APS-C sensor. Unfortunately, these cameras use an electronic viewfinder, much like a smart phone,. On the plus side, the above mirrorless camera mentioned have an image sensor that is physically many times larger than those used on a cellular phone. Plus, they are not nearly as noisy as an SLR. Bottom line: if I were of the generation that grew up playing Minecraft at age of four or five, I would have already definitely gravitated to this camera segment - but being an old-school photographer, I still shoot film. The downside of a film camera is the continual expense and the lack of instant gratification. The end game of film photography is the final print on photographic paper - which takes a while. In addition to film costs over the life of a camera, the photographer is not able to store a couple of hundred images on a single memory card. To properly load an 80 year old Leica is a skill set in itself. With that said - Loading film is pretty strait forward on most RF cameras that were designed after 1956. A third consideration is that after the exposures are taken there is more to do to display them than with digital. Exposed film needs to be processed - which I feel is best done at home. D.I.Y. at home means using traditional black and white films. 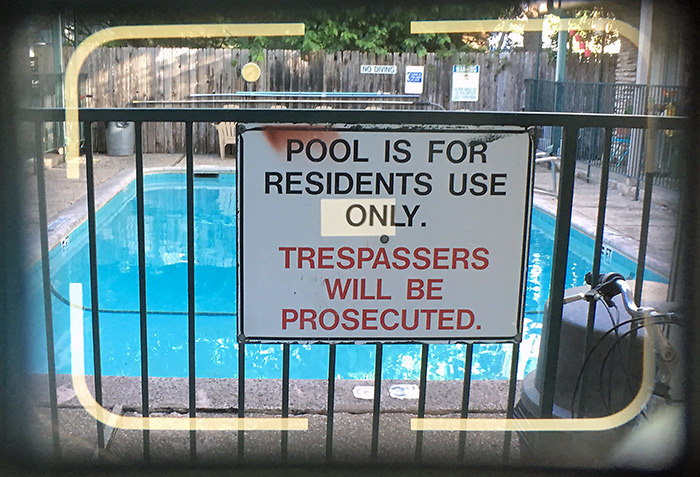 Next, the processed film must be scanned and electronically printed - or - better yet printed directly through the negative onto photographic paper using a traditional enlarger. Last but not least, film is also a hassle at airport security, - it really should be hand-inspected. My biggest beef with a film to digital workflow is the scanner. A dedicated film scanner gets the best results, but the results need further work in Lightroom or Photoshop. Proper scanning also takes a good bit of skill, software and time - which is extended by having to post process the scan. After all is said and done - I prefer an analog print that is made by directly shining a collimated beam of light through the negative and then a focusing lens directly onto a sheet of analog photographic paper. An analog enlarger versus digital convulsions results in a print that is not only sharper, but has greater tonality and gradation. As it would have been 50 years ago - with either a contact sheet or full-size print, the print is your scanned image. Unfortunately, the D.I.Y analog print is only best suited for B&W film. Many professional photolabs have closed down. A fully analog print must usually now be done by the photographer. There aren't many labs that still use a traditional enlargers. If analog printing isn't a practical option, then it is back to square one and the digital scanner option. On a final note - while film-based photography is no longer a medium that most professional photographers can make money with, - the use of an older rangefinder or an older SLR teaches one to observe and understand the nature of available light. : The photographer also must think about how it will be captured on film and proceed with the basics of achieving a proper exposure. In other words, a preautomated film SLR or RF camera will get the photographer in the habit relying on software that resides within the human brain rather than letting the camera decide what is best. Such a skill-set is definitely beneficial when the time comes to override/customize the automatic modes of a modern digital SLR.